The following is a sample from the new book Effective Python. They require special tools to coordinate with each other safely. This makes code that uses threads harder to reason about than procedural, single-threaded code. This complexity makes threaded code more difficult to extend and maintain over time. Threads require a lot of memory, about 8MB per executing thread. On many computers, that amount of memory doesn’t matter for a dozen threads or so. But what if you want your program to run tens of thousands of functions “simultaneously”? These functions may correspond to user requests to a server, pixels on a screen, particles in a simulation, etc. Running a thread per unique activity just won’t work. Python can work around all these issues with coroutines. Coroutines let you have many seemingly simultaneous functions in your Python programs. They’re implemented as an extension to generators. The cost of starting a generator coroutine is a function call. Once active, they each use less than 1KB of memory until they’re exhausted. For example, say you want to implement a generator coroutine that yields the minimum value it’s been sent so far. Here the bare yield prepares the coroutine with the initial minimum value sent in from the outside. Then the generator repeatedly yields the new minimum in exchange for the next value to consider. The game progresses one tick of the clock at a time. At each tick, each cell counts how many of its neighboring eight cells are still alive. Based on its neighbor count, each cell decides if it will keep living, die, or regenerate. Here’s an example of a 5x5 Game of Life grid after four generations with time going to the right. I’ll explain the specific rules further below. I can drive the count_neighbors coroutine with fake data to test it. Here I show how Query objects will be yielded for each neighbor. count_neighbors expects to receive cell states corresponding to each Query through the coroutine’s send method. The final count is returned in the StopIteration exception that is raised when the generator is exhausted by the return statement. Now I can finally define the simple game logic for Conway’s Game of Life. There are only three rules. I can drive the step_cell with fake data to test it. Now I want to run simulate in a real environment. To do that, I need to represent the state of each cell in the grid. Here I define a class to contain the grid. The grid allows you to get and set the value of any coordinate. Coordinates that are out of bounds will wrap around, making the the grid act like infinite looping space. To see this function in action, I need to create a grid and set its initial state. Here I make a classic shape called a glider. Unfortunately, Python 2 is missing some of the syntactical sugar that makes coroutines so elegant in Python 3. There are two limitations. First, there is no yield from expression. That means when you want to compose generator coroutines in Python 2, you need to include an additional loop at the delegation point. Python 2 doesn’t support yield from or return within generators. 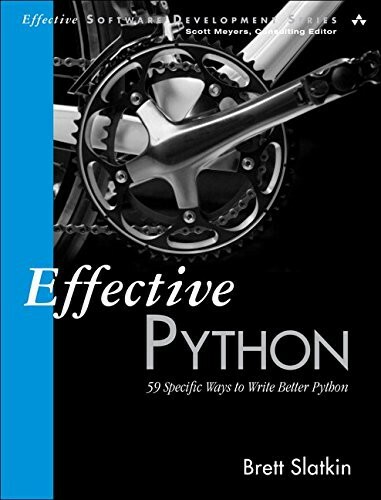 Effective Python provides insight into the Pythonic way of writing programs: the best way to use Python. Novice programmers will learn the best practices of Python’s capabilities. Experienced programmers will learn how to embrace the strangeness of a new tool with confidence. Items include advice on what to do, what to avoid, how to strike the right balance, and why this is the best choice.